Metal-organic frameworks is an emerging class of porous materials, with potential applications in adsorption, gas storage and catalysis. Mechanical stability of MOFs is crucial for the industrial scale technologies and has been one of the challenges in their wider adoption. Many MOFs also exhibit unusual mechanical properties and structural transformations that can be exploited in stimuli-controlled applications, such as sensing and drug release. Now, scientists from EPFL and the University of Edinburgh discovered how the diversity of the mechanical properties of MOFs is controlled by both the topology of the crystal structure and the non-bonded interactions, such as electrostatic and van der Waals interactions, between the atoms of the crystal. The non-bonded interactions, although much weaker than chemical bonds, may form a network of interactions, leading to a greater mechanical stability of the material. 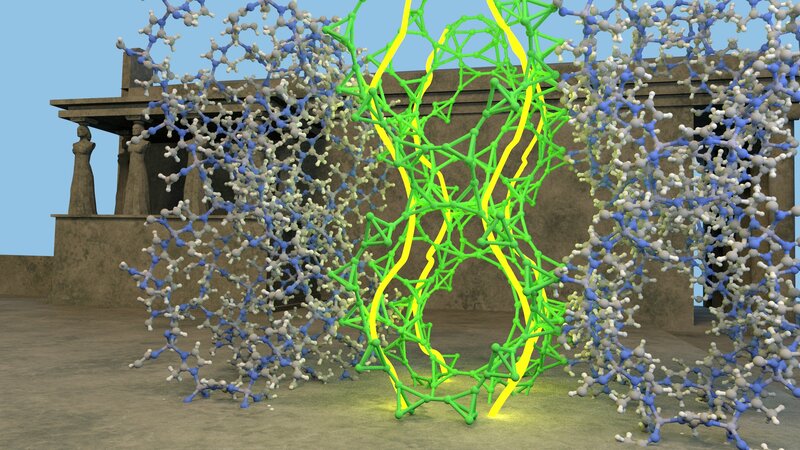 The authors describe these secondary networks as “chemical Caryatids” supporting the structure of the crystal. The authors believe these insights will help engineer materials and crystals with specific mechanical behaviour.